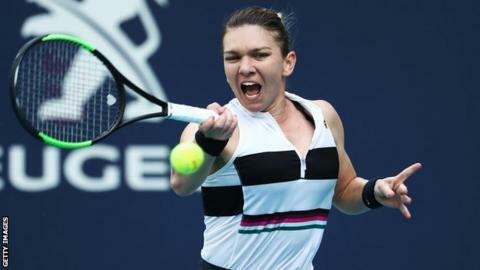 Simona Halep moved closer to reclaiming the world number one ranking after defeating China's Wang Qiang 6-4 7-5 to reach the Miami Open semi-finals. Halep only needs to reach Saturday's final to knock Japan's Naomi Osaka off the top women's rankings. "My coach said I was rushing a bit so I managed to calm down," she said. "That was great advice. I started well and played some smart tennis but in the second set, she started to raise her game." Halep converted seven of eight break points and hit 24 winners compared to 14 from Wang. She will play the world number five Karolina Pliskova in the last four, after the Czech beat her compatriot Marketa Vondrousova 6-3 6-4. The other semi-final will be played between Anett Kontaveit of Estonia and Australia's Ashleigh Barty.